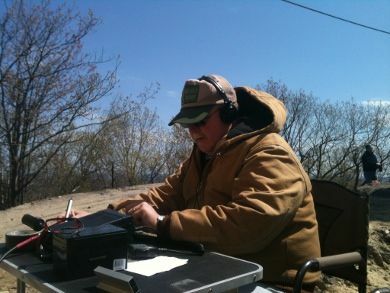 With the sun shining on the last Sunday in April, the WS1SM team ventured to Ossipee Hill to activate W1/AM-253 for Summits on the Air (SOTA). In only a few hours of operating, they made 26 contacts on HF and 2 meter simplex, using an Icom IC-706 MKIIG, battery power, and portable antennas. 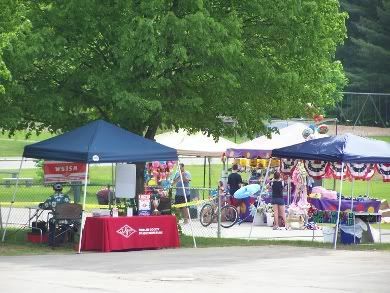 After a succesful 4-day special event at last year's 275th anniversary edition of the Gorham Founders' Festival, the Wireless Society of Southern Maine will return to take part in this year's festival, which will be held Friday, May 25th - Satuday, May 26th. 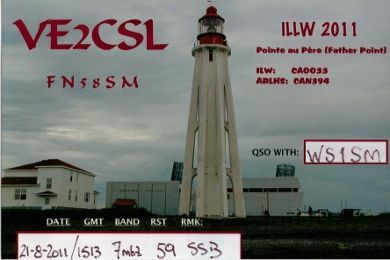 Here's the latest QSL card received for club station WS1SM. To view more, visit the QSL Gallery page on our website. When looking for an analyzer, I wanted something small and light for mountain-topping and special events. The iPortable turned out to be perfect for that application. Its compact size (about the size of a deck of cards, only slightly thicker), makes it easy to carry, and was just what I needed to set up antennas in the field. The unit is well built, with a cleanly arranged circuit board with no jumper wires. It operates on low power, using a 9-volt battery, and features simple push buttons to change bands and frequency step. The iPortable is easy to use. With the turn of a knob, it quickly finds the resonant frequency and indicates SWR, and shows instantaneously how the SWR varies with frequency. 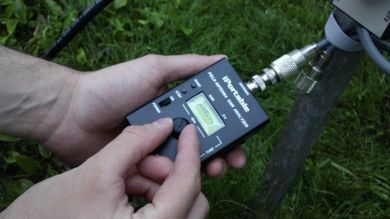 We tested the iP60z model, which includes the 6 meter band, and retails for $249.00. I received the unit in less than a week from the manufacturer. I am very pleased with it, and would recommend the iPortable to anybody looking for a small, simple, and reasonably priced antenna analyzer. For more information about the iPortable line of analyzers, click here. It's hard to believe it's that time of year again! Field Day is just around the corner, and WSSM is already discussing ways to capitalize on bonus points and improve on last year's score. There's been talk about using multiple transmitters this year, which will add to the technical challenge and the amount of air time required by each participant. In the weeks to come, we'll be working on Field Day related projects, including building band-pass filters, which will allow us to transmit on different HF bands in close quarters without desensitizing each others' receivers. 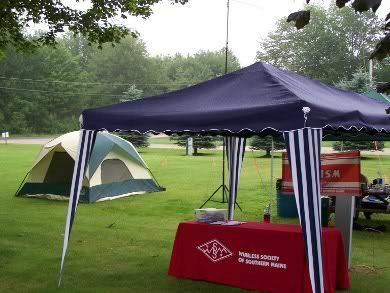 Once again we have permission to hold Field Day at Wassamki Springs Campground, in Scarborough, Maine. A special thank you goes out to the Hillock family for making this possible. June 14th - from 7PM-9PM at Wassamki Springs Campground. July 12th - from 7PM-9PM at Wassamki Springs Campground. The Wireless Society of Southern Maine would like to welcome Larry Feldman, W1GOR, as our latest member. Rumor has it that one of our club members has just earned Worked All States (WAS), and CQ Magazine's WPX Award. "They'll only be there for a few more days. You can't miss it," said Stefania, YO9GJY, who sent me an instant message. In a few moments of conversation, she reminded me about just how exciting chasing rare DX is, and one station in particular caught her fancy of late - a DXpedition to Socotra Island in Yemen, that was in its waning days of operation. Suddenly, a voice on the other end replied: "Hotel November Zulu, go ahead -" I almost fell out of my chair. "Was that my callsign?.. Could it be?" I guess that sometimes persistance, determination, and hard work really does pay off - or maybe it was just dumb luck. Either way, I managed to get through, and was also able to nab 7O6T on 15 meters as well. I hope some of you have had an opportunity to explore the bands this month, and maybe catch a few rare ones. Remember, if you don't have Stefania to remind you when and where that rare DX is on, a good place to check the spots is DX Summit. For more information about the 7O6T expedition, click here. If anyone is interested in contributing, just send along a story idea, brag, or picture to [email protected]. As always, I also welcome any comments or suggestions on how to improve The Radiogram for future issues. Disclaimer: Results are not typical. Determination, hard work and dumb luck are qualities posessed solely by the editor of The Radiogram, and may not work for you. Without going into the technical details of the thing, prayers, voodoo, and four-leaf clovers, have been known to work just as well for some people.